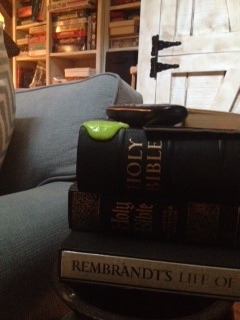 What a great reminder…walked through our family room and saw my grandmother’s Holy Bible covered with silly putty! LOVE IT!!! Love that the slimy putty was oozing down the bible. Made me think of a scripture…Deuteronomy 11:18-19 So commit yourselves wholeheartedly to these words of mine. Tie them to your hands and wear them on your forehead as reminders. Teach them to your children. Talk about them when you are at home and when you are on the road, when you are going to bed and when you are getting up. Today I will teach my children!